There are many options to a basement flooring system but it is of utmost importance to properly prevent water infiltration and adequately prepare the subfloor. 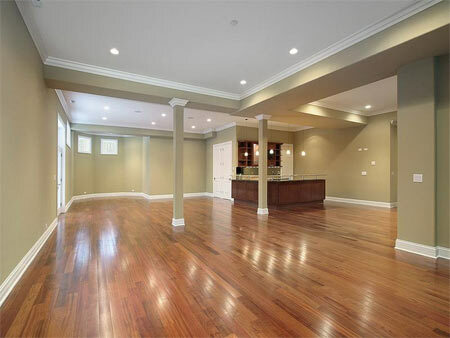 When choosing a basement floor system, you must keep in mind that the natural properties of the basement living space are significantly different from the main living area space. Because basement flooring systems must be placed over the top of a cement slab on grade, preparing the basement properly is of key importance. Even with a great waterproofing system and drainage system, there is no guarantee that the smallest amount of dampness will not evaporate from the groundwater through the porous cement and subsequently permeate your flooring system and basement. Backups of floor drains and plumbing pipes can cause flooring disasters. 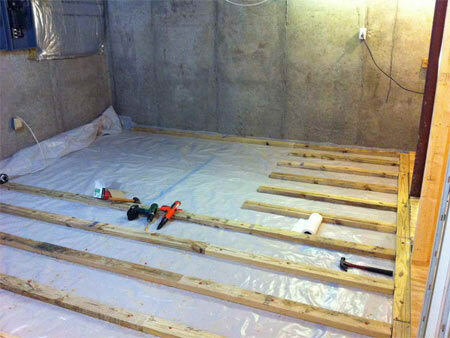 Selecting the basement floor system prior to construction allows the homeowner to consult with a certified waterproofing contractor, the homebuilder, and basement finishing experts to take measures that minimize water vapor penetration and dampness. However, in an existing structure, it could get costly to prepare the basement for flooring, but the price is well worth the investment. Prior to investing in a basement flooring system, the homeowner will want to ensure that the foundation, basement walls, and concrete slab are structurally sound. Foundation insulation and an exterior vapor barrier are recommended to increase energy efficiency in the basement and the entire home. The choice between an exterior or interior basement drainage system should be chosen to minimize water seepage, along with the proper grading and sump pump selection. If the homeowner is in the building process, the basement concrete slab can be poured taking the basement flooring choice into consideration. A request should be made for porous fill to be used in the aggregate bed. This porous fill allows for better drainage of groundwater that can either be directed underground away from the home or into a sump pump basin. Another example is that a hydronic basement floor radiant heating system will require flexible tubing to be looped and tied in place prior to pouring the slab. The concrete slab should cure for a minimum of 30 days before installing any subfloor elements. Whether the home is a new construction or an existing structure, concrete floors, walls, and foundations should be inspected for cracks, structural damage, and obvious water seepage. Further details can be examined in the following sections: Concrete Crack Repair or Repairing Bowed Walls. PVC applied over the slab with a multipurpose adhesive. 6 mil polyethylene sheets embedded into a skim coat of asphaltic mastic on top of the aggregate bed. 15-pound roofing felt embedded into a skim coat of asphaltic mastic on top of the aggregate bed. A vapor barrier between the concrete floor and your new flooring system is critical to maintaining a dry and long-lasting basement floor. A layer of insulation laid on top of the vapor barrier and along the foundation wall edges is beneficial to prevent leaching of heat through the cooler outside wall edges. This is the most crucial recommendation in the process. The insulation layer should be from one to two inches in thickness, according to the climate conditions. Colder climates should start with two inches of insulation at the outside foundation wall and taper down to an inch toward the center of the basement. The length of the insulated area is recommended at roughly 12 feet from the perimeter toward the center of the basement. In addition, ensuring proper foundation insulation increases the entire energy-consumption efficiency of a home. Insulating will minimize dampness and heat loss from the concrete slab making contact with the exterior basement wall. Air-gap membranes of special high-density polyethylene resin or floor matting are newer types of plastic vapor barriers, designed specifically to control moisture penetration in slab-on-grade floors. The durability of the material is evidenced by its impact resistance and capability to withstand heavy loads. Mold, fungus, and mildew will not develop on this material. The membrane is applied between the concrete and the subfloor. Air-gap membranes and floor matting may be able to suffice as a subfloor, depending on your choice of flooring material. Any type of flooring material is compatible with this vapor barrier material, but adhesives will need to be cleared with the manufacturer recommendations. Advantages of using this type of vapor barrier involve the dimples on the underside of the material that equalize the pressure from water vapor above and below the concrete slab. The loss of ceiling clearance is minimal at nearly a half inch, depending upon the manufacturer. This air space or gap allows a healthy humidity level throughout the living area. A thermal break is produced, providing greater comfort and warmth to the entire basement. 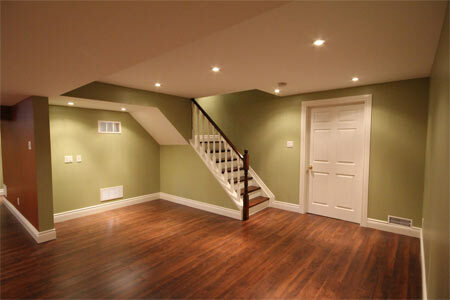 any homeowners are investing the time and money to make basement living space practical, comfortable, and attractive. It is wise to take the precautions in preventing water seepage, leaking, and flooding. With the number of available materials, most flooring materials are available in mold-resistant compositions. Epoxy floors are extremely durable, long lasting, and available in almost countless colors and styles. Although probably more suitable for warm climates, decorative polished concrete can be an excellent basement flooring choice. Vinyl plank flooring can offer some interesting and durable basement flooring ideas. Hardwood floors and carpet are not generally recommended for basements but with proper vapor barriers and insulation, they can be viable and attractive choices. 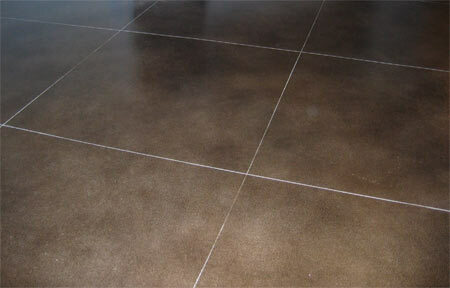 With tile, it is necessary to be careful of the subfloor preparation. If not using an air-gap membrane or floor matting, water vapor can permeate the tile. Cold, damp, and possibly slippery floors will result. Adhesives need to be chosen with care because of the subfloor preparation and because of the water vapor seepage. Linoleum is an inexpensive vinyl flooring material that has the advantage of offering a number of colors, patterns, and textures. Because it is plastic, the material is resistant to mold. The installation is usually quick because of the length of the sheets. Linoleum should be installed over the top of multi-ply board. These vinyl tiles are another inexpensive option. They are available in a variety of colors, patterns, and textures. The homeowner will have to be very conscientious about verifying that the adhesive used is resistant to dampness, or tiles will come loose prematurely. The advantage to peel-and-stick tiles over linoleum is that extra replacement tiles take little storage space. These tiles can be found specifically for mold and moisture-prone areas. Laminate flooring is a bit more expensive than vinyl flooring, but it is a bit higher-end with a variety of gloss levels. The advantage over linoleum and peel-and-stick tiles is that the patterns available attractively resemble many popular textures and patterns available in cork, stone, slate, marble, and industrial tiles. The tiles are also available in every type of wood grain imaginable. Laminate flooring can be installed with adhesives, by floating, or interlocking systems. Floorboards are also available with some manufacturers, making installation a bit quicker because of the larger size of the panels. Carpet may not be the best option for the basement. However, if you have taken the precautions to prevent water vapor penetration, leakage, and flooding, it could be worth the investment. Carpet manufacturers have developed carpeting options that are eco-friendly, mold-resistant, recycled, and in a larger variety of textures and patterns. Musty smells and premature wearing will result if water vapor penetration is not controlled. The relative humidity will seep through the backing and saturate the carpet fibers, harboring mold and mildew growths. Even if the carpet appears dry on the surface, moisture can get trapped between the backing and subfloor. Bamboo fiber is a popular choice for areas at risk for moisture and mold. The bamboo materials are plentiful, affordable, and have been used worldwide in tropical climates for centuries. The choices in carpeting may be a bit limited in patterns. When using carpeting in combination with a basement floor radiant heating system, keep the following in mind. Carpeting over the top of a concrete slab radiant heat will delay the heat-transfer into the basement living space. Because the carpeting acts as an insulator, the warmth from the concrete slab will initially remain trapped between the concrete slab and the carpeting. Once the carpeting is fully warmed, the heat will be absorbed by the surroundings, just as effectively as without the carpet. 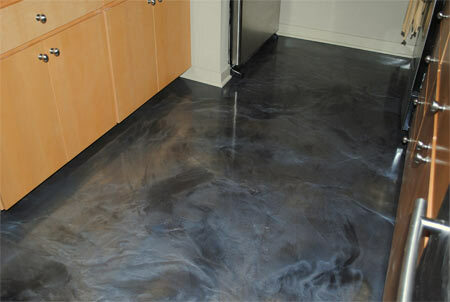 Full details are available on the section about basement floor coatings. The epoxy and hybrid coatings are relatively expensive in comparison with traditional sealers and paints. However, the long-term benefits of replacement costs compared with the other available choices, makes the initial price well worthwhile. If the homeowner ever experiences water leakage, seepage, or flooding, the resulting mess is easily cleaned up. The coatings are very durable and impact-resistant. It creates a seal, is resistant to water vapor penetration, and may be used as a vapor barrier layer for other flooring options. A variety of colors, finishes, and glosses are available, allowing homeowners to customize the look of the basement living space. When unable to completely eliminate the threat of water concerns, this basement floor epoxy coating makes the most suitable long-term solution. The flooring is very easy to clean and maintain. The coatings are nonporous and will not harbor mildew, fungus, or mold. Professional contractors and industry manufacturers hold mixed reviews on the use of hardwood flooring in basements. If you choose to contemplate hardwood flooring as an option, please read the more detailed section on Hardwood Flooring. Options such as engineered hardwood and bamboo fiber wood grain-patterned flooring may be the best choice for the homeowner determined to choose hardwood flooring. A few key points to consider involve damage to the hardwood and damage to the adhesives. The flexible PEX tubing or rubber tubing that pumps the heated fluid in hydronic radiant heat systems through the concrete slab, generates enough heat that it can damage the glue bonding the wood flooring to the basement slab. Wood laminate is recommended by most of the radiant heating manufacturers. Laminates allow more effective relief of expansion and contraction associated with radiant system heat cycles. Constant heat from the concrete slab can lead to excessive drying of the hardwood. Homeowners wish to spend their money for good value. With the lack of long-term endurance, constant maintenance, and high replacement costs, homeowners may agree hardwood is not the premium choice. 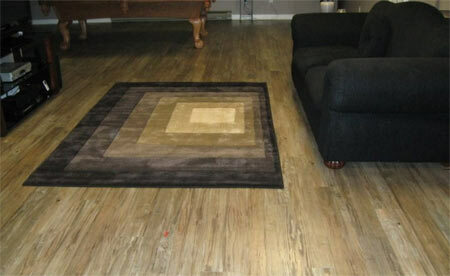 The above information will help lead the homeowner to making an informed basement flooring material choice. No matter which type of flooring material is chosen, it is of utmost importance to properly prevent water infiltration and adequately prepare the subfloor. Attention to detail will lead to the most satisfactory choice because the long-term investment can be maximized and enjoyed for years to come! Tip #157. Is it true that newer dehumidifier models are more efficient and less costly to operate? Yes, traditional models used much more electricity, daily maintenance, and did not address ventilation and repetitively recycled the same stale air. Current models can save the homeowner approximately $400 annually to operate over the older models and are safer. The cost reduction may make it worthwhile to consider the available options.